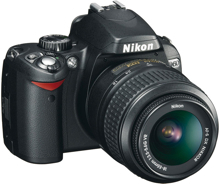 The Nikon D60 is a 10.2 megapixel DSLR with a 2.5 inch LCD (230,000 pixels). It features an ISO range of 100 to 1600 (extendable to 3200), image stabilization and dual dust reduction technology. The Nikon D60 measures 126.0 x 94.0 x 64.0mm and weights 495 grams. It boasts a fast start up time of 0.18 seconds. The Nikon D60 is being bundled with the AF-S DX NIKKOR 18-55mm f/3.5-5.6G VR lens. Nikon, Inc., today introduced the new D60 digital SLR camera, which provides consumers with stunning picture quality and versatility in an easy-to-use, compact camera design. The D60 joins Nikon’s award-winning line of D-series digital SLR cameras and shares a form factor similar to the D40 – Nikon’s smallest D-SLR camera ever. With 10.2 effective megapixels and a wealth of innovative and user-friendly features, the D60 enables both photo enthusiasts and those new to digital SLR photography to capture incredible images like never before. "The Nikon D60 makes stepping up to digital SLR photography easy for anyone, but is also a wonderful choice for photo enthusiasts looking for remarkable performance in a compact package," said Edward Fasano, general manager for marketing, SLR System Products at Nikon, Inc. "This model, like the wildly popular Nikon D40, greatly simplifies use and builds confidence in the user. With a host of innovative features, such as a visually intuitive LCD information display, Nikon’s highly regarded EXPEED image processing concept, new dual dust reduction countermeasures, in-camera editing tools and exciting creative options, the D60 enhances the picture-taking experience for picture-takers of all skill levels." Users will immediately appreciate the D60’s fast 0.18-second start-up time and split-second shutter response, which combine to eliminate the frustration of shooting lag – a common issue with many point-and-shoot digital cameras. With a fast and accurate autofocus and the ability to shoot continuously at up to three pictures-per-second, the D60 faithfully captures pictures that other cameras often miss. The D60 does all this while delivering extraordinarily vivid and detailed pictures, ensuring that fleeting expressions, special moments and memorable events are captured beautifully. Packaged with Nikon’s new AF-S DX NIKKOR 18-55mm f/3.5-5.6G VR image stabilization lens, the D60 camera and lens outfit delivers striking image sharpness. What’s more, Nikon’s proprietary VR (Vibration Reduction) image stabilization technology also dramatically reduces blur caused when shooting handheld pictures, especially in low light. The camera’s 10.2 megapixel CCD sensor delivers crisp, high-resolution images with astounding color and clarity, while Nikon’s advanced 3-D Color Matrix Metering II ensures that images are exposed beautifully and automatically, even in challenging lighting conditions. Additionally, Nikon’s new digital image processing concept, EXPEED, delivers smooth tones and accurate color for vibrant pictures and flattering portraits. The D60 also offers consumers comprehensive in-camera functionality, such as Active D-lighting. Through this innovative Nikon feature, the camera can, with the option selected, further optimize shadow and highlight detail–as pictures are taken. Shots that once required adjustment with photo editing software can now go straight to the printer, bypassing the computer altogether. For added fun and creativity while reducing or helping to eliminate time spent manipulating pictures later, the D60’s In-camera Retouch Menu enables users to accomplish a wide variety of tasks without a computer. The D60 offers new in-camera editing capabilities, including adjustable cross-screen star effects, color-intensifying filters as well as D-lighting, Red-eye correction, Image Trim and more. The D60’s Stop-Motion Movie mode is a D-SLR first that enables users to create stop-animation movie clips from a series of as many as 100 consecutive JPEG picture files. More experienced photographers will also enjoy shooting in the lossless NEF (RAW) format, and then adjusting image parameters, such as size, format, and white balance, all within the camera. Ergonomically designed with intuitively placed controls, the D60 is a camera that’s compact and ready to go wherever life leads. It also features a new power conserving Eye Sensor that turns the big 2.5-inch color LCD monitor on and off automatically when the user alternates between taking pictures and reviewing camera settings. A customizable LCD monitor user interface rounds out the D60’s convenient features, as users can create their own wallpapers and adjust color settings to adapt to their preferences. The D60’s design also supports Eye-Fi memory card functionality, enabling the convenient wireless transfer of images from the D60 to a computer, when using Eye-Fi memory cards. * Additionally, photos can be securely written to readily available SD cards, high-capacity SDHC cards and Eye-Fi memory cards, offering users a range of data storage options. The D60 will be packaged with the 3x zoom AF-S DX NIKKOR 18-55mm f/3.5-5.6G VR lens and will be available throughout the United States beginning in February 2008. This entry was posted in Digital Cameras, Nikon and tagged Nikon, Nikon D60 on February 9, 2008 by jonathanb.